Image © Ahoy Comics. Cover art by Richard Williams. Remaining credits as shown, colors by Felipe Sobreiro and Michael Garland, letters by Rob Steen. 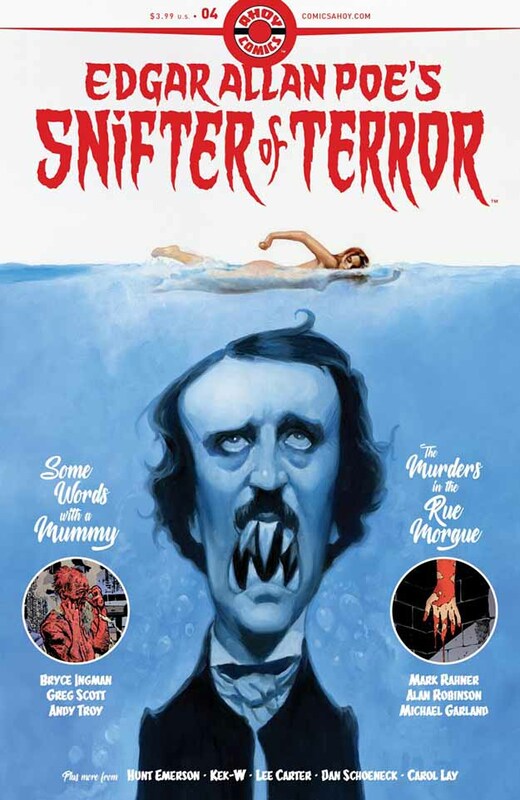 The second story is a Poe adaptation, with a few twists, of one of the first detective stories, “The Murders in the Rue Morgue.” Any frightening elements of the original have been left behind, but as a mystery it still works pretty well, and the new ending is moderately amusing. Another fun episode by Hunt Emerson of Poe vs. the Black Cat, and a one-page text story by the always interesting Carol Lay round out the issue. This entry was posted in Comics, Reviews on January 25, 2019 by Todd.